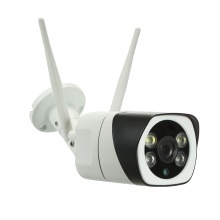 This WIFI camera features in P2P plug and play, HD 1080P video recording, and it&apos;s equipped with 2pcs IR lamps + 2pcs white light lamps, and IR-CUT double filter, which provides with good day and night vision. It is also with functions of two way audio, motion detection, waterproof and for Android/iOS phone APP remote control, etc. It is a good choice for home, apartments, shops, offices, hotels, schools, traffic and other needed places. *1/3&apos;&apos; CMOS sensor, HD 1080P, providing with high definition image quality. P2P, Onvif WIFI camera support wired LAN cable or WIFI connection optional. Support AP mode. *Built-in Microphone and speaker, support two-way remote dialogue, you can talk with your baby or lover freely without obstacle or scare off intruders while you are not home. *Equipped with 2pcs infrared array lamps + 2pcs white light lamps(Static: infrared LED light on; things moving: white LED light on, to deliver true colorful vision image). Night vision range up to 33ft/10m. *Motion detection function. The camera will be triggered to record when detect something moving, and push notification to phone APP. Support mobile devices remote view anywhere anytime. *Multiple ways to access on the PC and mobile phone, can be viewed by browser, and for Android/iOS phone APP. *IP65 waterproof, widely used in homes, apartments, telecommunications, government, schools, airports, factories, hotels, museums and other indoor and outdoor places.